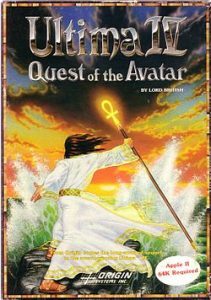 Good Old Games recently started offering the first six games of the Ultima series for purchase. They come complete with PDF’s of the manuals and maps, as well as integrated DOSBox set to just the right speed. It’s a great deal; you can get each set of three for only $6 U.S.! They’re the PC versions, so they have some shortcomings… Ultima’s II and III looks terrible in EGA graphics, and neither Ultima IV or V feature music. There’s fan patches available to fix some of this. I’ve decided I want to play through Ultima’s IV through VI, transferring the same character from each. I have never played any of these through on the PC, actually. I played Ultima’s IV and VI on the NES/SNES console, which are a very different experience. All three games feature turn-based tactical combat, which my own CRPG will have. So I want to see what works and what doesn’t, and what direction I want to go in my own designs. Ultima IV is where I’ve started, and so far, it’s going pretty well. The game is both more difficult and easier than the NES version, which offers much more static and predictable gameplay. Gosh, it’s kind of fun to grind for experience and levels… maybe removing them was a mistake? This entry was posted in CRPG, Gaming. Bookmark the permalink. Mumble… I think you are trapped in a huge dungeon level. I think you are trapped in a huge dungeon….